A historic win and a couple of school records highlighted the week in sports at Greens Farms Academy as the spring season kicked into full gear. The boys lacrosse team defeated Hopkins 10-5 to notch their first win over the Hilltoppers in 22 years. GFA boys lacrosse player Charlie Benson, right, helped lead the Dragons to their first win over Hopkins in at least 22 seasons last week. And the GFA track team saw a pair of records fall during a meet against Kingswood Oxford in the middle of the week. 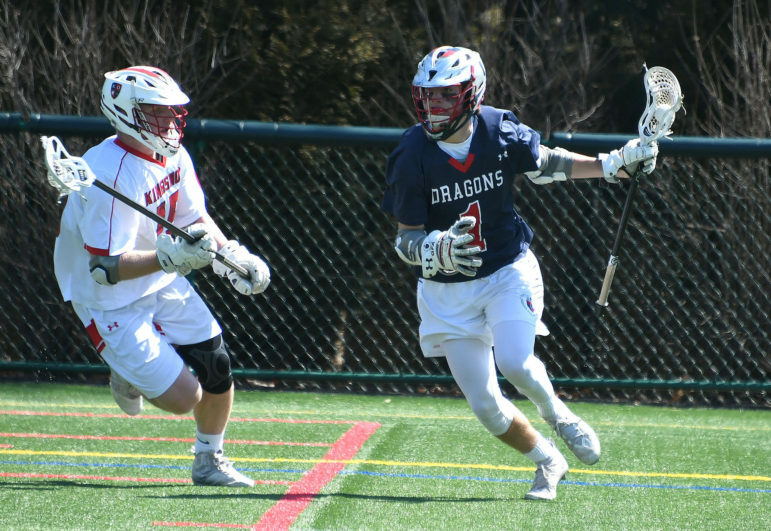 Zach Liston (Wilton) and Charlie Benson (Darien) combined for nine of GFA’s 10 goals as the Dragons bested Hopkins for the first time in at least 22 years with the win on Wednesday. Henry Mcdonald (Westport) also had a goal for the Dragons, who improved to 2-1 on the young season. Jack Grills (Darien) stopped 12 shots for GFA. Ella Murphy (Darien) and Alex Nesi (Fairfield) combined for seven goals, leading the Dragons to their first home win of the season 16-4 over King. Murphy scored four goals while Nesi scored three and Sara Peltier (Stamford), Isabelle Jackson (Darien) and Laci Raveis (Fairfield) added two goals each for GFA, which improved to 2-0 on the season. Marygrace Dellisanti (Wilton), Meg Nesi (Fairfield) and Kate Millard (Southport) added single tallies for the Dragons. Lucy Holzinger (Westport) and Murphy both had assists, as well. Kelly van Hoesen (Greenwich) made six saves in the game while Kaitlin Reed (Southport) added one. Later in the week, a balanced scoring attack led the GFA girls lacrosse team past Hopkins in New Haven on Wednesday 10-5. Meg Nesi scored three goals for GFA while Murphy, Alex Nesi, and Peltier each had two goals to lead the Dragons. Sarah Logan (Darien) added a goal and two assists while Raveis also had a setup. Van Hoesen made six saves in goal. Two school records fell during Greens Farms Academy’s first dual track meet of the spring season against Kingswood Oxford at Conard High School in West Hartford on Wednesday. Sophomore jumper Tim Northrop (Fairfield) cleared 6-feet, 2-inches in the high jump to set one new mark while Haley Nilsson (Fairfield) won the 1,500 in 5:25 to also break a record. Also, for the GFA boys team, which lost 95-50, Ethan Phan (Bridgeport) was a two-event winner, taking first in both the long jump (18-0¼) and triple jump (34-2½). For the GFA girls, which fell 91-42, senior Kristiana Modzelewski (Westport) swept the hurdles, taking the 100 race in 17.7 and 300 in 52.5. The other winner for the Dragons was Cassy Callari (Weston) in the discus (56-1). Mary Kessler (Westport) led a 12-hit attack with three hits and two RBIs while Piper Dove (Norwalk), who led the game off with a triple, and Gabriele had two hits each. Janise Park (Bridgeport) also drove in three runs while Rari Bellingeri (Stamford) and Gabriele had two RBIs each. Eight of GFA’s 10 players scored runs. The Dragons notched three hits and left three runners in scoring position against one of the top pitchers in the league in a 15-0 loss to Hopkins earlier in the week. The Dragons bested King 6-1 in a road match on Wednesday, pushing their record to 2-0 in the process. Conner McDonald of Westport (6-4, 6-4), Davis McDonald of Westport (7-6 [7-1], 6-1) and Jack Wolfsohn of Easton (6-2, 6-2) won singles matches while the doubles teams of Aidan Helfant (Westport) and Matt Timashev (Greenwich) won 6-1, 6-1; Nik Simonsen (Greenwich) and Albert Bostoen (Westport) won 6-0, 6-2; and Jordan Liu (Stamford) and Will Schadt (Norwalk) won 6-0, 6-0, as well. The Dragons made the trek to Wooster and came away with a 6-1 win. GFA took five singles wins courtesy of Connor McDonald (6-1, 6-2), Jack Ramsay of Darien (6-1, 6-0), Wolfsohn (6-3, 6-0), Simonsen (6-2, 6-1), and Bostoen (6-3, 6-3). The Dragons also took doubles wins from Aidan Helfant/Sam Lublinsy of Westport (8-3); Liu/Schadt (8-1); Sean Pratt (Greenwich)/Owen Minson (Darien) won 8-1. The Dragons won their second match in two outings with a 6-1 win over Christian Heritage on Monday. GFA took three of four singles and swept the doubles in moving to 2-0. Lane Durkin of Darien (8-2), Ryan Boyle of Stamford (8-3) and Dasha Timasheva of Greenwich (8-3) took wins in singles with the doubles squads of Anya Bettegowda (Wilton) and Annebel Brawn (New Canaan) won 8-2; Harriett Wells (Westport) and Lane Murphy (Darien) won 8-3 and Michelle Fedotova (Greenwich) and Ava Ewing (Darien) won 8-4. The Dragons made the road trip to Hopkins and fell by a 6-1 score in New Haven on Wednesday. Boyle, at second singles, took a 6-0, 6-2 win to highlight the day for GFA. Timasheva battled tough, falling by a 3-6, 7-6 (7-4), 10 (12-10) score at third singles and at second singles the duo of Wells-Murphy fell 7-5, 4-6, 1-0 (10-8). Down a few players this weekend, the Dragons still had enough depth to post a shutout win at Millbrook. Boyle stepped up to the No. 1 slot and earned a 6-1, 6-1 win to lead the Dragons. Bettegowda and Brawn broke up their doubles tandem and played singles, each winning, as well. At fourth singles, Allie Agnew (Westport) won by a 6-1, 6-1 score. In doubles action, Wells and Lane Murphy won 6-2, 6-0; Ewing and Allison Telesz (Fairfield) won 6-1, 6-1 and Callie Morgan (Darien) and Margot Goldsmith (Darien) won 6-4, 6-2. GFA is now 3-1 on the season. After a day-long rain postponement, Rye Country Day School defeated Greens Farms Academy 7-3 on Wednesday. Sean Hogan (Westport) was 2-for-3 with two RBIs and a run scored. Ian Brown (Darien) also had two hits and scored a run. On Friday, on the road, the Dragons fell 7-1 to King. Brown, Mark Roszkowski (Westport) and Charlie Lafreniere (Norwalk) each had hits while Lafreniere, an 8th grader, also pitched three innings with three Ks. In their first two matches of the year, the GFA golf team fell to two of the league powers by 5-0 scores. Brown shot a 49 to defeat his opponent with Epps firing a 43 to split his point. Giani Panariello (Westport) also shot a 43, falling by a stroke in his match. Epps and Eli Kennon (Greenwich) led the way with a pair of 40s for GFA. Piero Panariello (Westport) had a 42 while AJ Tenser (Westport) and Will Paliotta (Westport) each had 44s. Greens Farms Academy beat Staples (2-0) and Greenwich High (2-0) on Wednesday. The Greens Farms Academy sailing team just missed qualifying for the O’Day Regatta by taking fourth place in this weekend’s qualifying race in Greenwich. The team missed making the finals by one spot, but still shocked the state’s sailing scene with a fourth-place showing. The Dragons amassed 87 points to finish ahead of Choate, Greenwich High, Fairfield Prep, Fairfield Ludlowe and Staples.